Can there be any real challenger to Pinocchio's status as the greatest animated film of all time? History has overemphasized Disney's role in the field, rightly focusing on the studio's innovations and perfections of existing techniques, yet too often relegating the work of other studios -- of entire countries even; hardly anyone conceded the accomplishments of other nations in the field of animation until the animé blew up in the '90s -- into the periphery by those eager to establish Disney's dominion over all. Yet even those fundamentally opposed to the gargantuan evil that is the corporation's current identity cannot deny Pinocchio: it's not as colorful as Sleeping Beauty, as emotionally affecting as Dumbo, as purely artistic as Fantasia nor as varied as Alice in Wonderland, but above all entries is Disney's uneven canon it retains a certain something, a timeless of design and storytelling and a feeling of magic that Walt Disney, flawed individual that he was, used to chase so desperately. It remains surprising, and more than a little vexing, to note that Pinocchio flopped upon its original release, a disappointment after Snow White and the Seven Dwarfs proved to be the unexpected hit of its time, arguably in all of cinematic history. Not until Disney re-released it as a part of their old business model of putting old animated features back into theaters every seven years or so to ensure that every child had the chance to see these films on the big screen (Lord, how I wish they still did this). It is true of a number of Disney Animated Features that the animation style in some way reflects another medium of storytelling, and like most Pinocchio resembles a storybook.,Yet it also looks like a series of paintings. Brushstrokes are visible, contrasting with the most sophisticated use of the multiplane camera that Disney used from its shorts all the way through The Little Mermaid in 1989. Thus, every scene looks alternately as flat as it actually is and as deep as the complicated multiplane movements allow. Consider one of the first shots of the film, after we meet Jiminy Cricket (who looks at the camera and speaks directly to the audience, immediately highlighting the storybook setup) and leap into the book he opens: after the camera pans over a cityscape, it cuts to a shot outside Geppetto's shop. Suddenly, the camera appears to hop toward the shop; this is a 1st person shot of Jiminy moving, which exists because the animators figured out how to do it and because it makes the story that much bouncier (no pun intended). Note also how shadows seemingly grow and shrink as if real when the camera moves, and how, brushstrokes and all, Pinocchio is still one of the most finely detailed animated pictures ever, which automatically makes it one of the most detailed films period. If its color scheme is not as vibrant and immediately arresting as that of Sleeping Beauty, Pinocchio nonetheless features the richest color scheme of any Disney feature. Geppetto's shop is filled with magnificent clocks and music boxes of all shapes, sizes, colors and rhythms. The film's episodic structure gives the animators a freedom of scope that might not have been allowed for a more rigidly plotted film. Thus, both the characters and the "sets" contain the most imaginative work ever conceived for a Disney picture, at once existing for the pleasure and ego of the animators, who'd managed the impossible with Snow White and now wanted to prove their mastery, and to enrich the story, which would be terribly lacking without it. Everything strikes the perfect balance between reality and fantasy: Figaro, drawn by Eric Larson into an adorable ball of fluff, looks and walks exactly as a cat should, yet he has the personality of a spoiled child, and without a single word he becomes as human as the living puppet. Bill Tytla, greatest of animators, morphs the villainous Stromboli into a great mound of flesh: so large is he that his fat appears to break out of the lines that confine his character, rolling with every syllable and step. He's such a presence that the room itself appears to quiver along with his folds. Gustaf Tenggren painted the initial storyboards for the backgrounds, which the animators transposed so masterfully that one would never think to insult the tracers of the world after seeing the process (shown in a fairly thorough making-of). Completed with the insertion of the tiniest details by Albert Hunter, made all the more clear by the phenomenal job Disney did with its Blu-Ray restoration and upgrading, the world of Pinocchio is as tangible yet abstract as the characters. The effects animation is just as spectacular: the use of water, drawn to exacting perfection to resemble nature, has a certain look and feel in its movement, realistic as it is, that sets it apart from all future attempts to simply draw water as water is. It's almost as if the water is sentient, capable of moving and reacting to Monstro the whale, a beast so gigantic and fearsome that the water surrounding him attempts to flee along with the sea creatures. No live action effects work approached the level of expertise and seamless integration into the film for decades. This combination of identifiable animation with bold experimentation carries over into the narrative, which plays out in the typical storybook fashion but finds a fresh presentation through the character of Jiminy Cricket. Voiced by the vaudevillian and character actor Cliff Edwards (the first "name" actor to appear as a voice), Jiminy replaces the usual dry narration in favor of a streetwise, cocky guide who routinely addresses the audience, undercuts a severe moment with levity and offers snide rebuttals. "A very lovely thought," he says when Geppetto wishes upon a star for Pinocchio to be a real boy, "but not at all practical." He is responsible for the film's biggest flaw, however: when Honest John sweeps Pinocchio into Stromboli's puppet show, Jiminy looks upon his ward's success and decides that Pinocchio must not need him any longer, neglecting to consider how Geppetto will feel about losing his boy and how crowd adoration does not equal happiness. At least this misstep ends with a nice punchline: "What does an actor want with a conscience, anyway?" Even the music in Pinocchio is exemplary. Leigh Harline's score is one of the best in cinematic history: he covers a massive breadth of moods and styles, capturing the first truly maudlin feeling in a Disney work when Geppetto heads out into the rain to look for Pinocchio or the scene where Pinoke and Jiminy return from Pleasure Island to find Geppetto's home empty (a scene no less gut-wrenching than anything found in Dumbo, Disney's most heartbreaking feature). He cascades through cultures in the vamp of Pinocchio's number "I've Got No Strings to Hold Me Down," starting with a cabaret feel before speeding up and flavoring the song with international tones. Complementing Harline's brilliant soundtrack are the lyrics of Ned Washington, who makes "I've Got No Strings to Hold Me Down" so darn catchy and crafted the musical summation of Disney, practically the anthem of the corporation*, "When You Wish Upon a Star." There aren't five better songs written for a film in all of cinema (only "Over the Rainbow"comes to mind**), and never has a song so fully tapped into the mindset not of a single film but the entire ethos of its architect. If all of these elements are so good, so beautiful and so entertaining, you may ask, how could the film have flopped? Hey, beats me, but there are some indicators. 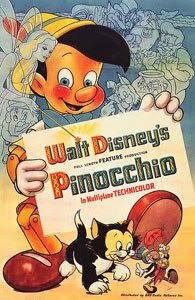 Pinocchio cost twice as much as Snow White, and it came out when Europe was too besieged to give a damn about film distribution, thus limiting foreign intakes to better insure against losses. The likeliest answer, though, is that the film is terrifying: it takes the petulant cad of Collodi's original serials and makes him into a beacon of innocence, and then forces that softened boy to face the same gamut of perils that a far more unsympathetic character endured in the original stories. For the original Pinocchio, such tribulations likely seemed justified or at least peevishly enjoyable, but Disney's version never does anything to deserve such punishment. Each episode leads the boy further into hell: tricked into joining a show run by a man who initially seems amicable -- his roly-poly body communicates geniality -- but he quickly turns into a monster, throwing Pinocchio into a cage and threatening to make firewood of the boy when he outlives his profitability. The lad escapes, only to find himself carted by a sinister Coachman to Pleasure Island, which I must say is far more troubling in its aesthetic than I remember. It's a hedonistic den when all the naughty children of society may play until they turn into donkeys to work in the salt mines below the park. When Pinocchio at last returns home, he finds it empty and receives a note informing him that Geppetto was swallowed by the great whale Monstro. Pinocchio is, simply, a series of downers. (This explanation does little to account for the later success of Dumbo, which was even crueler to a character that managed to be even more innocent than the wooden boy). Yet Pinocchio also has a sweetness characteristic of all Disney films, and if the cruelty is necessary to prevent the sugary side from becoming saccharine, so be it. The film deals in truisms that are openly stated as well as visually illustrated: "A lie keeps growing and growing until it's as plain as the nose on your face," "Give a bad boy enough rope, and he'll soon make a jackass of himself." As with the best of the studio's pictures, Pinocchio is simple in effect, which is not, naturally, to say that it is simplistic. It's far too technically accomplished for that, and besides, it utilizes its simplicity to widen its appeal. In the wake of the death of silent films, animation became the most universal of film styles, capable of speaking to audience across age and cultural divides. Disney would soon adjust its demographic in order to turn a profit, aggressive targeting children instead of crafting grand cinematic achievements, and Pinocchio, though not the last example of Golden Age animation, stands as the apex of a time when a cartoon about a wooden boy facing challenges could be as staggering and timeless as the most lavish Hollywood production. *This is almost literally the case now, as "WYWUaS" has been played before every Disney feature since the second Pirates of the Caribbean movie came out in 2006. **I nearly pitted "Singin' in the Rain" against it, until I realized that the song was written far before the film. Funnily enough, it was sung, small word after all, by Cliff Edwards. Flopping upon release has actually informed many film masterpieces Jake, not to mention a bevy of theatrical works, concerts and operas. The most startling example is Puccini's MADAMA BUTTERFLY, which was laughed off the stage at it's La Scala opening. The perfect example of an American film that did not do well on it's initial appearance is IT'S A WONDERFUL LIFE. But in the case of PINOCCHIO, I think the form (feature animation) has not yet taken hold, and it took a little time before it was rightly seen as the masterpiece it is, a conviction of course that you bring to the table here with this absolutely extraordinary review. Only FANTASIA is on the same level among the definitive animation masterpieces methinks, though I also have a strong affection for SNOW WHITE AND THE SEVEN DWARFS. I'll never forget the night my father took me to a local movie palace in the early 60's to see PINOCCHIO, and the lasting impression it made on me. It was actually very scary, as the whale scenes really had me looking away as I recall. Of course you pose in your essay here that this quality may have caused the film to tank, but I'm not so sure. It was about a revered literary property, and the form was a novelty, so I'm more inclined to think it was more a matter of timing. Yes Harline's score is one of the greatest in history, and at least as great as the one he collaborated on with Frank Churchill (SNOW WHITE) and it's really the vital underpinning to this rapturous an dthrilling work, which takes it's place among the greatest films of all-time. I had a wonderful time reading this masterful consideration.